The story is that the Fed has tended to overestimate the strength of the economy, and has consequently had to maintain easy policy longer than policymakers had anticipated. Assuming the Fed continues this pattern of errors, they may delay the now-anticipated exit from asset purchases. As monetary policymakers continue to emphasize, policy is data dependent. I am sure this difference has not been lost on the Fed, especially if they have a Phillips Curve view of inflation. I suspect that as unemployment creeps lower, they will downplay low growth in favor of emphasizing the importance of low unemployment. This is especially true now that Bernanke has defined a 7% trigger for ending asset purchases. 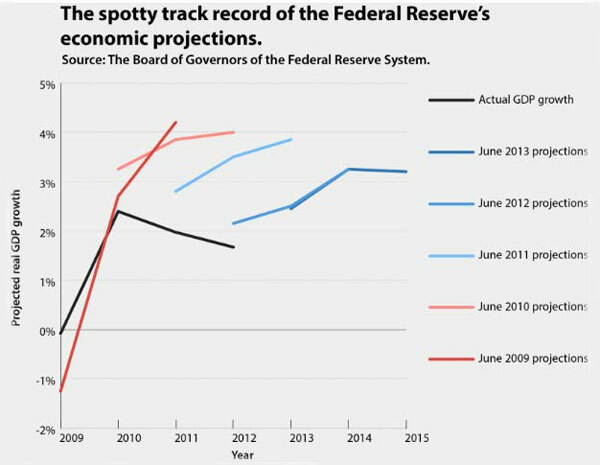 In short, don’t assume that a failure to meet the growth forecast will hold the Fed’s hand. 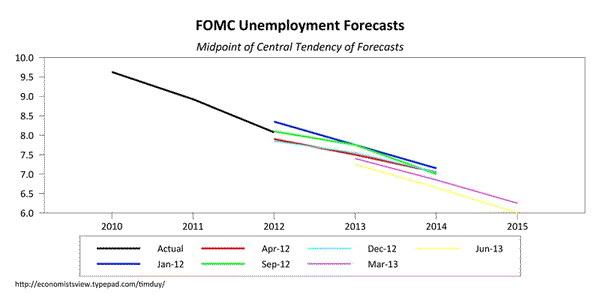 Watch the unemployment forecast; it may be more important at this point in the policy cycle.